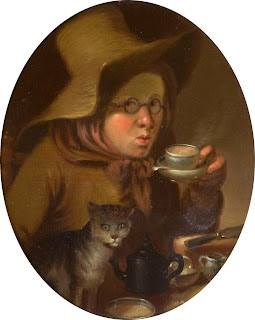 Proving once again that tea and cats are eternally linked. Possibly because of the spinster implications? Well, the lady (?) in this painting looks like she's abstained from more than just liquor. And she probably won't have anyone showing her a night out on the town, not with that freaky kitty warning any suitors away. At least she's got milk in her tea, and a slight flush on her cheeks - perhaps she's just warming up after a bit of fun in the snow? I have almost no information behind this painting, so the story behind it is anyone's guess. Hey i left a comment last week on this post but maybe u never got it?